Prawn Salad with lashings of Mayonnaise. This is one of my favourite Summer meals and barely a trace of a carbohydrate. On a hot sunny day, I like to sit on the patio and eat this. Heaven! Lay the leaves on a plate. 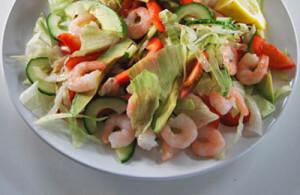 Mix the prawns with some mayonnaise to coat them and place on top of the lettuce leaves. Chop up cucumber and advocado into small pieces and sprinkle around the dish as you wish. Top with chopped up tomatoes and more mayonnaise on top.